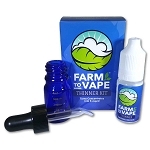 The Farm to Vape Kit was the first wax to e-juice kit on the market introduced in August 2014. We were frustrated with the wax vape pens on the market as they always leaked the wax out if they were not in an upright position. This made for many sticky messes in backpacks and car doors with the worst timing of course. We thought there has to be a better way, what if we could turn wax into e liquid? Thus the idea was born. We designed our wax to ejuice kit to work with all waxes and other herbal concentrates. In our early experiments, we bought a homogenizer to try and break down the cell walls of the wax in an attempt to blend with a PG / VG solution. It separated. This wax to ejuice method using traditional nicotine style substrates of PG and VG didn't work for us even using a $700 homogenizer, something the average consumer can't necessarily use. Then we did more experiments with PEGs, and quickly learned there are a lot of different molecular weights and grades (medical, industrial) from suppliers as there are for PG and VG. We researched the molecular weight of the active ingredient in wax so we could make a wax to e juice kit that anyone could use. Thus our proprietary formula of PEG 300 and PEG 400 in our wax to e juice kit was created. We also researched the different freezing points and viscosities to create the most stable blend that won't separate from wax once the wax has been liquified. We then sourced medical grade PEGs from an ISO9001 company and had them bottled in an ISO9001 clean room facility to ensure the utmost quality in our Farm to Vape Thinner line of products. We also wanted our wax to ejuice kit to be simple and discrete, no syringes or shot glasses. We decided a boilable dropper bottle was the way to go. It took a lot of searching to find the right supplier, as most of the caps are made from an inferior plastic that comes off the bottle during boiling. We couldn't allow this to happen with our wax to ejuice kit. After about two dozen different dropper bottles, we finally found the right type of plastic cap that was made in the USA. This boilable glass dropper bottle is key to mixing wax into e juice discretely and efficiently with minimal waste. The user can add a 1/4 gram of wax to the dropper bottle, and add 3/4 gram of Farm to Vape Thinner and boil the bottle in water for three minutes. This makes 1ml to fill one cartridge. The dropper top in the Farm to Vape wax to ejuice kit can fill any vape cartridge or vape pen. A lot of people use it to drip onto an RDA. The electronics world seems to change by the week, so it's difficult to recommend a cartridge or vape tank. Check out our Farm to Vape Kit and turn your wax to e juice today!